“As a 7-year-old she came to live with relatives in North Birmingham so she could get schooling unavailable to her in rural Madison County. She remembers teachers who made students read with inflection, who seemed harsh but pushed her to excel long into life. So it hurts when she sees students who can’t expect the same learning she got in Birmingham 75 years ago. Arnold’s endorsement of Dr. Hall’s focus on the children is an important reminder of the commitment anyone working in the field of education should have. It also underscores the current malaise affecting many school systems, which fail to provide the quality of education Dr. Hall experienced as a child many years ago. Also in the Birmingham News, Jeremy Gray recalled Hall’s career in an article on her appearance at the Birmingham Civil Rights Institute on September 30, where a reception in her honor was held. The attention given by these newspapers to Dr. Hall is evidence of her remarkable reputation and record as an advocate for children and for excellence at all levels of education in the state, a story which is told more fully in her book. 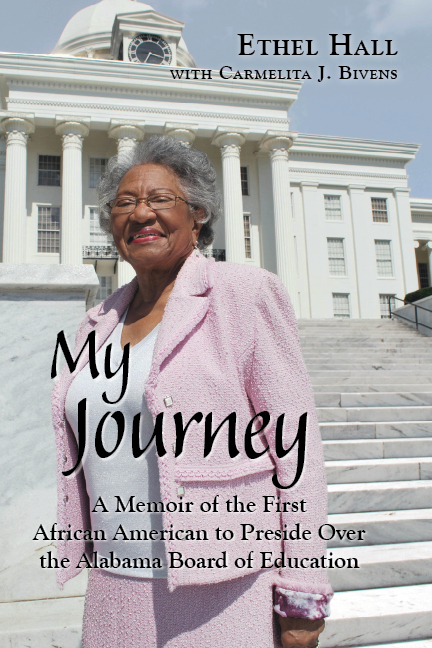 My Journey is available from NewSouth Books, Amazon.com or your favorite online or retail book seller. You are currently browsing the archives for the Ethel Hall category.